Though the Indian government is making a great effort to make education accessible to the masses, India is still lagging behind other developing nations as far as education is concerned. India’s literacy rate is 64.8% (53.7% for females and 75.3% for males). The literacy rate for Youth (15-24 years of age) in the middle-income countries is 87.8 percent whereas in India it is 73.3 percent (Human Development Report-2003). Out of 94 developing countries, the position of India is 76th so far as educational development index is concerned. Percentage of students who enrolled in Class-I and reached to Class-V is 77 in the developing countries, but in India, it is only 60. (The State of World Children-2004). Even among the working class, 40% of the workforce is illiterate and another 40% almost illiterate. We have mooted the initiative of sponsoring the school education of children below the poverty line, encouraging rural based job oriented education and fostering other talents and skills in underprivileged children. In India, it is very difficult for poor families to afford education even in Government schools as they have many mouths to feed. So, when a family is unable to pay the fees, young children are often removed from school and sent to work and earn for the family. According to the surveys conducted by Education Science and Technology Ministry, India, 39.70 percent boys and 41.90 percent girls drop out of school between Class I and Class V due to poverty. 53.30 percent of the students drop out of school before they reach Class X. 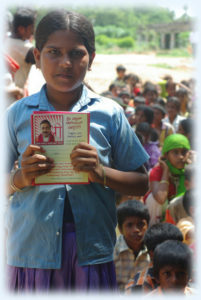 As per the 7th All India Educational Survey of 2002, 17 million children in India are engaged in child labour. Therefore we have identified 1695 underprivileged children in Bangalore who could not afford to pay their school fees and are sponsoring their education so that they could continue their schooling. The details of the schools where these children are studying are provided below. 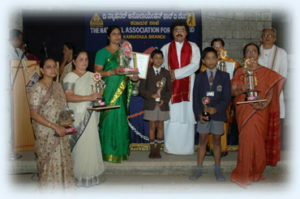 – Government High School, Uttarahalli – 302 children. 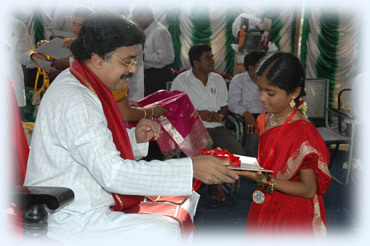 To help those who are in the economically backward sections of society to start earning as soon as possible and to reduce the migration of rural population to towns and cities, we sponsor the education of students who opt for rural-based Job Oriented Courses like Handloom Weaving, Sericulture, Organic Farming, Water Management, School Teaching, Tailoring etc. In addition to sponsoring the formal education of children below the poverty line, we also believe in fostering and encouraging their talents. They rarely get an opportunity to display their talents as an appropriate forum is seldom made available to them. – We sponsored a 3-day talent show called “Pratibha Karanji” or “The Fount Of Talent” where more than 500 children from 23 Government and Aided Schools participated. Free Food was provided to all the students, participants, teachers and organizers. As seen in the photograph many handicapped children also took part in this joyful event. – A special workshop was organized for the students and teachers of The National Association for the Blind [NAB], India, where they were taught special techniques to release stress and enhance their awareness and concentration. At this event, the children who had collected funds for the NAB were also felicitated. We provide accessories like notebooks, textbooks, geometry boxes and so on to students who cannot afford to buy them. 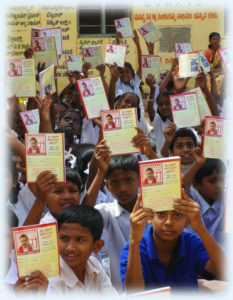 During the academic year of 2008 – 2009 we printed and distributed 2500 notebooks in several rural schools in Karnataka, India.